They jumped ahead of the visiting Minico Spartans and never let go, as the Wood River High School varsity volleyball team posted a Homecoming Week league sweep Tuesday. Senior co-captains Kori Paradis (8 kills, 3 blocks) and Lily Richards (7 kills, 12 winning serves, 3 aces, 1 block) led the Wolverines to a 25-14, 25-14, 25-22 Great Basin Conference home victory over Minico. Coupled with Wednesday’s 25-20, 25-18, 25-16 home loss to the three-time defending GBC champion Twin Fall Bruins, Wood River (12-10, 3-2 league) got a leg up on the third-place spot in the six-team league. That’s quite an improvement over last year, when coach Tim Richards’ Wolverines were seeded sixth in the GBC tourney. Wood River still has two games left with Canyon Ridge, including next Tuesday’s road clash with the Riverhawks in Twin Falls. Tuesday, Wood River had success with its serving and played fine defense led by Paradis, Richards and sophomore Ciceley Peavey. Another soph, Haley Cutler (5 winning serves), cranked out two aces to lift the Wolverines into a 13-9 lead in the first game. After blowing Minico away in the second game, the Wolverines found a more stubborn Spartan defense in the third game and fought from behind much of the way. With the score tied 20-20, the Wolverines wore Minico down 25-22. Statistical leaders included Peavey (9 winning serves, 2 aces), Paradis (5 winning serves), Cutler (6 kills), Sadie Dawson (2 kills), Mary Petzke (2 kills, 1 block), Brittney Bradley (2 kills, 17 assists, 4 serves), Sydney Thomsen (2 winning serves) and Madi Hendrix (1 kill, 3 serves, 2 aces). 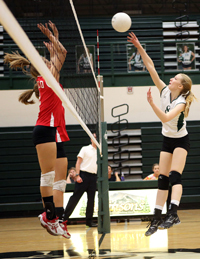 Minico juniors Kailee May (10 kills) and Becca Child (2 kills, 3 blocks) led the Spartans. It was a challenging night for Wood River against Twin Falls Wednesday. Stat leaders were Richards (10 kills), Paradis (5 kills, 15 service points with 2 aces), Petzke (3 kills), Bradley (14 assists) and Peavey (22 digs). “The girls played their heart out on defense, digging many balls,” said coach Richards. The Carey Panthers (5-4, 3-4 league) won their second straight Northside Conference road match 15-25, 25-14, 25-16, 25-9 over Castleford Tuesday. Also Tuesday, the Murtaugh Red Devils clipped the visiting Community School Cutthroats 25-17, 25-12, 25-19. The Cutthroats host Camas County of Fairfield today at 5 p.m. at the Fish Tank in Sun Valley.